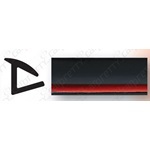 Car Pretty LLC - Drip Rail Moldings - Black, Flexible, Rubber Water Seal. 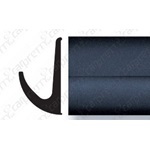 Drip Rail Moldings - Black, Flexible, Rubber Water Seal. J shaped rubber car drip rail, truck drip rail, RV drip rail and even house drip rail all divert rain watter away. This Trim-Gard product is an a black flexible drip rail trim molding that comes in a roll in various lengths. This Trim-Gard product is an a black flexible rubber seal trim molding that comes in a roll.